It’s finally sumner in the uk and this week, it seems like it is too! There’s nothing better than being sat outside in this weather, just taking it in. It’s nothing like the uk, being able to wear shorts all day and having to always have sunglasses on. I think all of the uk is pretty much the same - we’re all outside! The first thing I grabbed was my suncream. This is a necessity as especially in this heat, your skin needs the protection from the sun and uv days as they are so dangerous if your face is exposed. I personally wear suncream everyday but in the heat I apply a lot more just so my skin gets the protection it needs. Still in the front of skin safety, I grab my spf lip balm. This is so important in the past, my lips have blistered due to the sun and I really don’t want it to happen again. I always make sure I’ve a lip product with spf whilst I’m on the sun because I’d rather have the extra protection and it’s watermelon flavour so I’d just reminds me of summer anyway. I love reading and I have been slacking recently but this is changing now. Nothing is more enjoyable then sitting and reading the sun! I love reading all of the summer themed books and with it being warm the weather is so much more fitting for it. 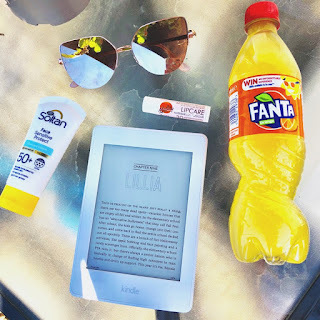 My kindle is the best thing especially in this heat to use and I love it so much. Finally is the drink of all summer drinks, Fanta. Nothing reminds me more of holidays and summer than Fanta (normal & lemon). I rarely drink both of them any other times of the year so when it’s like weather, I have this all the times! It’s just the summer drink and it doesn’t feel like summer without it. I know when it’s sunny what I go for and these are pretty much my first choice! I just aren’t moving from my garden once I’ve got these, it’s too lovely not to soak this weather in! It has! My mums always taught me to wear suncream all the time. I’ve been so busy though I haven’t done much reading.